Share Tea Din ing Business Corporate was founded in 1992 by Mr. Cheng Kai-Lung and we started off our business with to-go black tea and pearl milk tea drinks. With great comments and feedback from our customers Share Tea was known as good tea. Since then, we have expanded our branches all over the world and we have had great success as part of the tea-drinking sector. 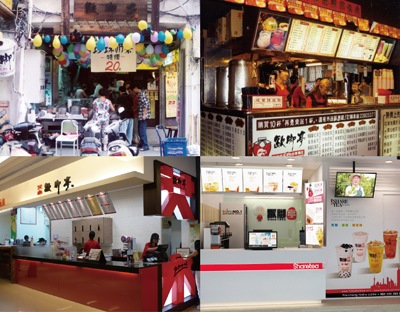 In 1992, the very first shop of Share Tea opened in Taipei City; three years later, Share Tea Corporation was founded; in 1999, the franchise brand “CUP-BON” was established in Malaysia successfully; in 2004, the patent T-shaped bag was invented and became a new trend; in 2010, Share Tea first chain store was opened in Hong Kong which is famous for its marvelous cuisines and within a short period of time, 40 chain stores were opened all over Hong Kong and Macao; in 2011, we targeted Chinese markets including Beijing , Shanghai, Guangzhou and Shenzhen; also expanded our markets worldwide from Singapore, Malaysia, Philippines, Brunei and Australia to New York and even Dubai. The image of “a Sharetea drink in your hand” has imprinted in our customers’ minds which leads Sharetea Pearl Milk Tea to its success internationally. The chairman of Lian-Fa International Sharetea, Cheng Kai-lung, has always seen himself as a leader in tea-drinking sector. Share Tea is the only beverage industry franchise corporation which is recognized as “Taiwan Good Chain Store” by Ministry of Economic Affairs, Taiwan for 6 consecutive years. We were the only pearl milk tea at the 2009 Taipei Deaflympics and the only pearl milk tea brand that represented Taiwanese culture in R.O.C. 100th birthday celebration. What we see ourselves in the future is to expand our market like a ripple with a new way of thinking which means health + tea drinks = healthy trend, and a new way of marketing which means creation + tea drinks=creative new fashion. Our mission is to introduce to the world the most authentic Taiwanese tea-drinking culture!